What am I: I am a city of 120,000 people. It takes three days to walk around me. We were warned of destruction by someone who had been in the belly of a fish. The World was recently saddened by the death of one of America's leading figures - General of the Army Douglas MacArthur. MacArthur left the world a legacy of advice, some of which we report here. Washington, D.C. I was in the nation's capital when the sobering announcement came over the public address system: "Ladies and gentlemen, General of the Army Douglas MacArthur died moments ago at 2:35 P.M. Eastern standard time." Everywhere, guests in hotels, businessmen in their offices, tourists on the street, national leaders in government offices - all stopped to reflect on the impressive life of this man. In Congress the next morning a special session was called in memory of the General. Dr. Charles Dorothy, a fellow staff writer of The PLAIN TRUTH, and I attended this meeting. Senators from various States rose one after the other to express respect for the many ACCOMPLISHMENTS of this noted American soldier and statesman. 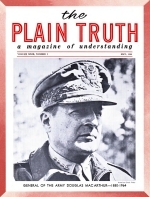 The staff of The PLAIN TRUTH magazine pays similar tribute here.